A complex codebase creates a complicated, error-prone, and difficult-to-maintain environment where development teams spend additional time updating insufficient code. Bloated or insufficient codebases frequently cause problems for business. These issues have become common for most development environments because of the growing complexities experienced as organizations rapidly produce or maintain software. Code scans help developers clean up a codebase and detect potential errors capable of impacting the production phase itself and customers upon implementation or release. Several methods are applicable for reviewing a program prior to implementation or release. Manual code review takes more time and does not guarantee the finding of potential vulnerabilities within source code. A code scanning tool decreases the time it takes to complete this process, but code scanning is typically not a detailed enough analysis to provide useful guidance. Most organizations that work with simple code scan tools have found that many results surface, but it is hard to find the truly meaningful results that require attention and action. Software analysis tools get beyond simple code scanning software to uncover areas that can truly be problematic. How Do Organizations Benefit From Code Scan Software? Code scan software helps programmers locate potential flaws and determine areas of improvement within the codebase. Code scans may be performed during program creation or as enhancements are made to provide insight regarding potential vulnerabilities. Some code scan results, provided as immediate feedback, have proven to be useful for mitigating risk within complex IT development environments. Code scans can produce metrics, such as complexity and lines of code, that can be used in combination with software analysis tools at the system level to combine unit-level analysis with system-level analysis at various stages in the lifecycle. Such a regimen can help detect coding flaws or vulnerabilities during any phase of development. As opposed to manual review or code scan software, system-level software analysis supplies more accurate results. A manual audit or a code scan does not detect critical vulnerabilities between application layers or specific security flaws capable of impacting an entire infrastructure. Software analysis offers an automated solution capable of identifying potential security flaws or design errors that could impact data or operations as an application moves through each phase of development. 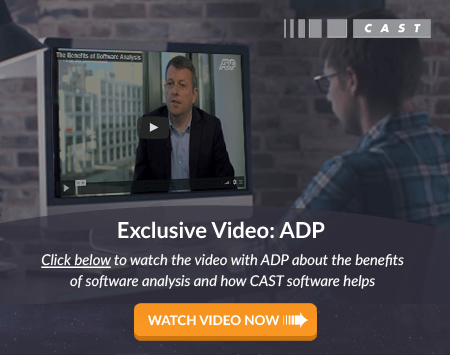 CAST Application Intelligence Platform is an enterprise-class software analysis solution for obtaining objective, repeatable measurements of size, quality, and complexity. This data can be used to benchmark and monitor development practices and to implement improvement efforts for creating secure, easy to maintain source code. To see how we can help you, click here to get a free demo of our enterprise-class software analysis solution today!